Royal Air Force Charitable Trust Enterprises - News: Live Stream Available! 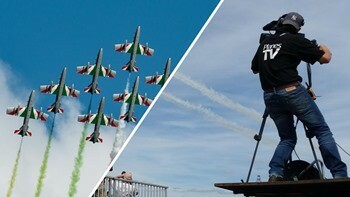 Home » The Airshow » Visiting the Show » Latest News » News: Live Stream Available! Can't make it to this year's Air Tattoo or want to watch it again? PlanesTV will be broadcasting live from cameras situated around RAF Fairford on Friday 13, Saturday 14 and Sunday 15 July to bring you an amazing live experience, wherever you are in the world. One of the world's largest military airshows will be staging a special international celebration of the Royal Air Force's centenary with a range of exciting flypasts and aerial formations featuring current and historic RAF aircraft. More than 30 air arms from around the globe will be taking part from as far afield as Canada, Australia, Oman, Pakistan and Ukraine. Highlights include displays by the MiG-21, F-35A, Typhoon, CV-22B Osprey, AMD Mirage 2000D, Rafale and Chinook and, of course, the Red Arrows. On Demand replay of the broadcast available for 7 days - so if you miss something you can come back later and enjoy. So, log in, sit back and watch the world's greatest airshow from the comfort of your own home! This summer's Air Tattoo will feature a thrilling seven-hour flying display, featuring fast jets, aerobatic display teams, helicopters and giant transports. Tickets give access to live broadcast and also a video on demand replay until midnight on Sunday 22 July, so you can watch it again and again!